Snowfall was created by bassist PB Riise and guitarist Tore Meli after the dissolution of their previous band Winter Parade. They struggled along without a vocalist for awhile before hooking up with Brit sensation Lee Small, whom Riise had worked with in the past. Now they bring their debut album, Cold Silence, on Escape Music. There seems to be a seasonal theme to Riise's efforts. What you have here is classic melodic hard rock with several significant characteristics. The first is Small's powerful vocal style, which ranges from rock with a hint of blues at times (House of Prayer, Stampede) to soothing passion (Heaven's Not Up There). The second is the rich guitar work. If you want guitar solos, both varied and soaring, you got it. Finally, the mix is enthusiastic and vibrant. Cold Silence gets off to a chilly start (pun intended) with Don't Drive Me Home Tonight, a song that seems to drag on at nearly twice its five minute length. But things improve immediately with the rock standards of Citadel of Hope and House of Prayer. From here to the end it can feel like a mixed bag of music, Heaven's Not Up There is a fine ballad, as is the closer Vesper Bell, a good one of a different character. Wolf's Lair, Stampede, and Oscillate bring back that classic melodic rock with energy and creativity. But then Jack of Diamonds and Alexandria seem dull in comparison. Nevertheless, it's probably not fair to call this an uneven work because every song has merit, and they're well crafted and well performed. 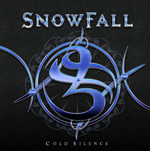 Simply: if you dig classic melodic hard rock, I believe you'll like what your on Snowfall's Cold Silence. Recommended. Snowfall's Cold Silence melodic hard rock in the best tradition with good songs powered by Lee Small's formidable vocal style, some large guitar work, and crisp production.